Pie, it’s what’s for dinner. Honestly though, this is not that kind of pie. The crust only makes you think you’re cheating. When I made this for dinner last night, it was definitely a last-minute, what do we have to make a meal, kind of dish, but it turned out delicious. I used a leftover half of a cooked spaghetti squash, which was great because it cut down on cooking time, and the squash was already cooled so I didn’t have to worry about it cooking the egg prematurely. In case you’re wondering, I used the other half of the squash with an artichoke and lemon sauce from Williams Sonoma the previous night. My husband returned from a trip yesterday and I originally thought we would eat out, but we were both tired from golf, travel and pregnancy (respectively), so I decided to scrounge around the kitchen so we could relax at home. My pie pans haven’t arrived yet from our last duty station, but a cake pan worked just fine. Suffice it to say, this dish is easy, can be made last-minute, and can be built from a wide variety of ingredients. 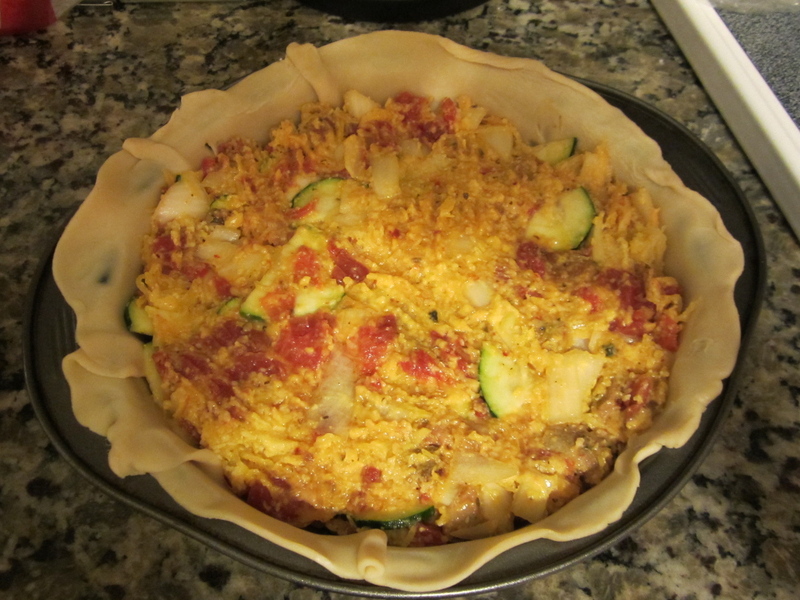 As long as you have two refrigerated pie crusts, one egg, some cheese, and a small selection of vegetables, you can create this pie. Just as I did, get playful with this meal and use what you have. Maybe you have different kinds of meat, vegetables or cheeses on hand. Perhaps you want to make it vegetarian. As long as you use some cheese and an egg for binding, and make sure to drain excess grease and liquid (avoid a soggy crust) before building your pie, you can make it your own. This is one of those recipes that looks and tastes impressive, but is as easy as making a casserole. It’s also a great way to sneak in a boatload of veggies. I did not add salt and pepper. It simply didn’t require it. To really dress up the plate, you could serve a mixed green salad on the side. It would be lovely for a brunch, lunch or dinner. Set out pie crusts to bring to room temperature. Do not grease pie pan. Cook meat in a skillet. Add tomatoes, fennel seed and red pepper. Cook for 5 minutes. Drain excess grease and liquid. Let cool a bit so it won’t cook the egg when mixed in. In a medium bowl, combine squash (I used a fork and knife cross-cut to help the spaghetti mix more easily), zucchini, onion, cheese and egg. Add in meat and tomato mixture. 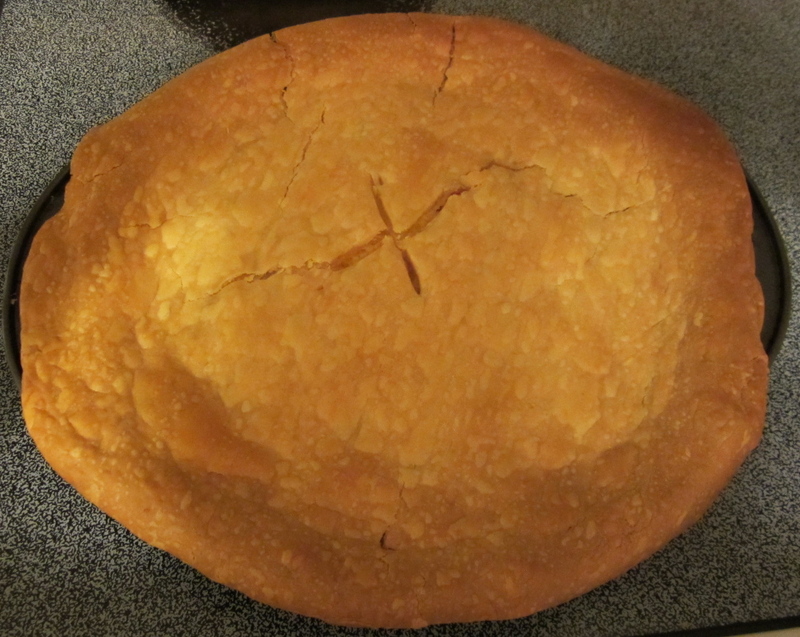 Pour mixture into first pie crust, press, top with second crust, cut slits in top, bake at 350F for 50 minutes.